The owners of Logik washers may experience some technical problems with their home appliances due to mechanical damages or software faults. If your device is out of service for some reason, don’t rush to the nearest repair service center – there’s a possibility to repair the washing machine on your own: the manuals below will help you with that. On this page, you can see the maintenance and repair guides for different models of Logik brand washers. They are present in the form of tables for your convenience. These maintenance guides enlist the most widespread technical problems of Logik washing machines, possible causes of problems, and the ways of solution. They are provided by the official manufacturer and are easy to follow by an average user. Aside from that, the tables contain error codes – each stands for some certain malfunction. 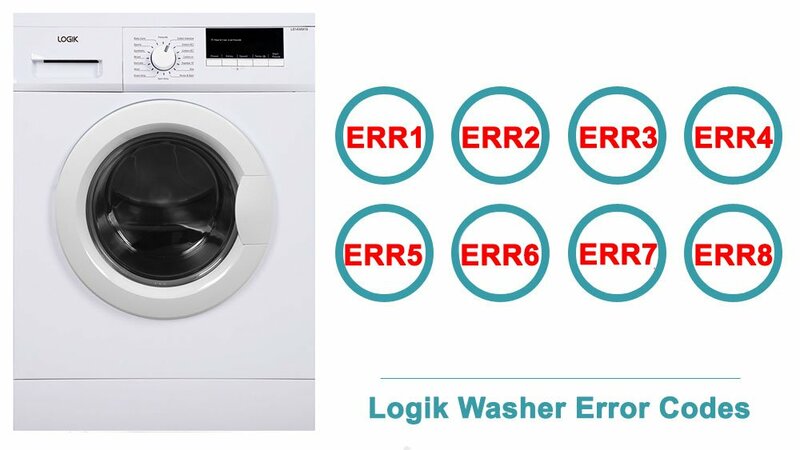 Whenever your Logik washer displays an error, you can quickly figure out what exactly the problem is, and how to eliminate it. There’s no need to search for the printed manual – the instructions are always available online. These step-by-step guides are comprehensible and simple even for users without technical knowledge. However, if you doubt whether you can handle the maintenance process on your own, don’t hesitate to contact the professionals – serious mechanical damage and software troubles should be handled by a master only. Err1 Looking door function malfunction. Reclose the door. Err2 Draining malfunction. Rinse the filter of draining pump, examine whether the drainpipe is blocked. Err3 Temperature pickup malfunction. Ask a qualified technician to repair it. Err4 Heating malfunction (display after procedure operation). Err5 Water intake malfunction. Check the water pressure is too low or water supply is cut off. Err6 Drying and heating malfunction. Ask a qualified technician to repair it. Err7 There is a lot of foam in the washing machine or motor failure. Select and run a programme to fill and then drain the washing machine or ask a qualified technician to repair it. Err9 Drying temperature sensor malfunction. Err10 Water level sensor malfunction. Err12 Drying water level sensor abnormity. Check whether the clothes are dried or not, and whether there is water in the washing machine. Dry it again after the drying process. Unb Washing machine has an unbalanced load protection function. When unbalanced weight is greater than allowable maximum, the washing machine will not spin and will run at a low speed to avoid abnormal vibration and noise. • In case washing 1 piece of laundry (carpet, bed sheet, table sheet, etc) make it symmetrical inside the drum. • Lower the wet weight of laundry pieces by wringing manually and placing them back in the drum in symmetrical position. • Take out and then reposition the laundry pieces inside the washing machine in a more balanced position on the inner wall of the drum. • Add 1 or 2 pieces of laundry into the drum to reduce the unbalanced load effects. • Restart the spin cycle by choosing Spin programme. In case the failure persists, please ask a qualified technician to repair it. EUAr Communication malfunction. Ask a qualified technician to assist with repairs. Err 01 The start/pause light blinks. The door is not shut properly. Shut the door properly so that you hear the click. If the problem persists, turn off the machine, contact a qualified technician. Err 02 The programme ready light blinks. The water level in your machine is below the heater. The pressure of your water supply may be low. Ensure the water supply tap is fully on. Water supply may be off, check it. If the problem persists, your machine will automatically stop after a while. Unplug your machine, turn off the tap and contact a qualified technician. Err 03 The start/pause light and programme ready light blink. The pump has failed or the pump filter is obstructed. Clean the pump filter. If the problem persists, contact a qualified technician. Err 05 The start/pause light and programme end light blink. The heater or heat sensor has failed. Shut down your machine and unplug. Turn off your tap and contact a qualified technician. Err 06 The programme ready light and programme end light blink. The motor has failed. Err 07 The programme start/pause light, programme ready light and programme end light stays on permanently. Configuration error. Err 08 The start/pause light, programme ready light and programme end light blink. The motor has failed. Err 09 The programme ready light and programme end light stays on permanently. The network voltage is too high or too low. If the network voltage is lower than 150V or higher than 260V, your machine will automatically stop. When the network voltage is recovered, your machine will continue its operation. Er 10 Inlet water overtime of 7 min • Open the water tap, to check if the inlet hose is squashed or kinked, check the filter in the inlet valve is blocked or not; check if the water pressure is too low. Er 21 Overtime 3 min of the drainage • Check if the drain pump is blocked. Er 30 The door has not been closed over 3 times • Check if the door of the washing machine is closed. • Check if the clothes is pinned by the door. Others • Please call up the service line if there is any other problem. E01 The door of your machine is left open. Close the machine door. If your machine persists to indicate fault, turn off your machine, unplug it and contact the nearest authorised service agent immediately. E03 Pump is faulty or drain filter is clogged or electrical connection of the pump is faulty. Clean the drain filter. If the problem persists, contact the nearest authorised service agent. E04 Your machine has excessive amount of water. Your machine will discharge water by itself. Following the discharging operation, turn off your machine and unplug it Turn off your tap and contact the nearest authorised service agent. No Water Water cut-off or low mains water pressure. Water tap may be closed. Check. Mains water may be cut-off. Check. If so, switch the programme knob to STOP. You can select a programme and run your machine after the mains water is supplied. Mains water pressure may be low. Check. Water supply hose may be twisted. Check. Water supply hose may be clogged. Clean water inlet hose filters. Valve inlet filter may be clogged. If the problem persists, unplug your machine, turn off your tap and contact the nearest authorised service agent.